Special offers at Ramat Rachel Hotel! Only a few minutes’ drive from the bustling Jerusalem city center and the Old City, among the tranquil fields of Kibbutz Ramat Rachel, stands the Ramat Rachel Hotel. The unique location – a kibbutz adjacent to the city – makes the Ramat Rachel Hotel the ideal place for those who prefer a quieter home-base with a country feel, but do not want to compromise on convenience and proximity to Jerusalem attractions. The hotel offers a wide range of facilities for every possible activity: romantic getaways, family vacations, private events, professional conferences, tours, and sports and leisure activities. The hotel’s restaurant serves three kosher meals during the day. There is also a coffee bar open till midnight at the hotel’s lobby, a synagogue, gift shop, and the Kibbutz’s supermarket where you can have a “old times” shopping experience. 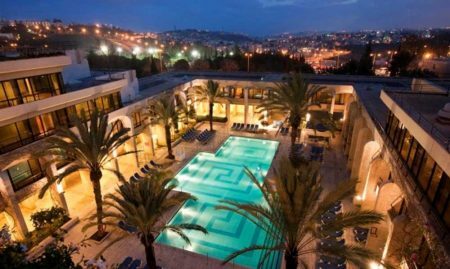 Ramat Rachel Hotel offers 165 spacious and fully-equipped rooms with magical panoramic views of Jerusalem, Bethlehem and the Judean Desert. There is a variety of room types and categories, and all rooms are perfect both for a romantic getaway and for a happy rural family vacation. In addition, the hotel’s rooms are big and have all the facilities necessary for the accommodation of children and infants. If you’re planning an event, private or professional, Ramat Rahel Hotel is the right choice for you. The hotel’s conference center boasts 15 fully-equipped meeting rooms of different types and sizes with everything you can possibly need for a successful gathering. In addition, the hotel has four beautifully designed indoor and outdoor banquet halls for any type of event: weddings, birthdays, Bar/Bat Mitzvah, and more. The experienced staff will help you to design precisely the event you envision and will accompany you every step of the way. Ramat Rachel Hotel believes that a true recreational experience is defined not only by taking time out from our everyday lives, but rather by what we choose to do with that time out. Therefore, the hotel provides its guests with a direct access to a wide range of all possible amenities and facilities. The hotel’s jamboree room offers joyful family moments for children and adults alike. The room is equipped with all possible facilities and promises pure pleasure and entertainment for the entire family. In addition, the hotel has a large sports complex with lush lawns that consists of tennis and soccer courts, a spacious gym, three swimming pools, including one for kids and an all-weather swimming pool, and the longest water slide in Jerusalem. Coming soon are a Turkish bath, Pilates and fitness lessons. For a true relaxing experience, guests have the possibility to book massages and treatments or just sunbathe on the lush lawns. From agricultural and archaeological guided tours to visiting the homes of members of Kibbutz Ramat Rachel, there is always something to do at Ramat Rachel Hotel. Take a self-guided tour at the Kibbutz; enjoy an Israeli folklore performance at the “Punch line” club; learn about the ecological movement in Eyal’s Farm; enjoy stunning views of Jerusalem and the surrounding villages at Mitzpeh Yair lookout point; take part in the adventure quiz and search for answers while walking through Ramat Rachel’s archeological site, or get a picnic basket, rent a bicycle and tour all by yourselves. The rich selection of tours and social activities at Ramat Rachel Hotel guarantees an interesting, fun and transformational vacation. Book your stay at Ramat Rachel hotel and enjoy a variety of special offers at the hotel’s official website! For more information dial +972-72-3290740. We hosted a weekend in the hotel recently, using some of the private halls. All our guests were happy with their rooms. The halls were well maintained and the staff helpful. Although the swimming pool is a short stroll from the hotel, it's worth it as it has extensive grounds and a great kids pool. Food was varied and of a good standard. Not only the buildings are very pleasant to walk thru, the staff is very professional. It's a well taken care property, the rooms are spacious and very clean. The food is diversified. It's a different experience than been a regular hotel but no less enjoyable. I highly recommend this kibbutz. This 26 square meters room with huge windows overlooking a panoramic view of Jerusalem’s nature provides the right atmosphere for a perfect vacation. A luxurious room of 30 square meters with a wonderful view of the Judean Mountains. The perfect room to watch the dessert washed in golden colors during sunset or sunrise. The room is fully equipped and reservation includes free entrance to the hotel’s fitness center. The hotel’s largest, most luxurious and exclusive room with a large Jacuzzi bath tub that will give your romantic getaway the perfect final touch. This sunny and spacious room of 26 square meters offers the ultimate rural experience. Enjoy your morning coffee outdoors while breathing fresh Jerusalem air on your private sitting area surrounded by the hotel’s beautiful green lawns.